Twice A Day Training With Phil Learney! The current trend or one of the things I seem to be getting a lot of questions on is doing multiple training sessions in a day. I’m going to explain to you a bit about the concept, the systems and also the application of it. I’m going to put into a flow chart the decisions you have to make before even thinking about this concept. Sadly we are almost always tainted in our decisions by the simple fact most of us believe more is always better. With the exception of diet when the concept of less food and more exercise STILL remains prevalent. Those of you that have embraced my program’s will know this is something I firmly DO NOT believe in!!! The concept of working multiple sessions a day is nothing new, during the 70s Soviet Bloc weightlifters used this system and in many cases continue to do so, very effectively. Bulgarian Weightlifters seemed to use it with great success. By performing multiple sessions it allows us to increase the overall volume of work an athlete can perform in a allotted time period and also to target multiple systems and goals. You could in theory target mass, strength, power and conditioning all within a 24hour period or less dismissing and challenging (also proving wrong) the myth that multiple goals cannot be achieved at the same time. Fat loss and lean tissue gained being the most hypothesised goals of choice. We know that if you can increase the cross sectional are of a muscle we can therefore increase its strength potential. If we can increase motor unit recruitment we can increase the cross sectional area. This is why in an ideal world when a coach tells you he wants his player to be bigger and stronger and you have a given time to do it it often becomes a trade off UNLESS you start to incorporate multiple sessions per day. 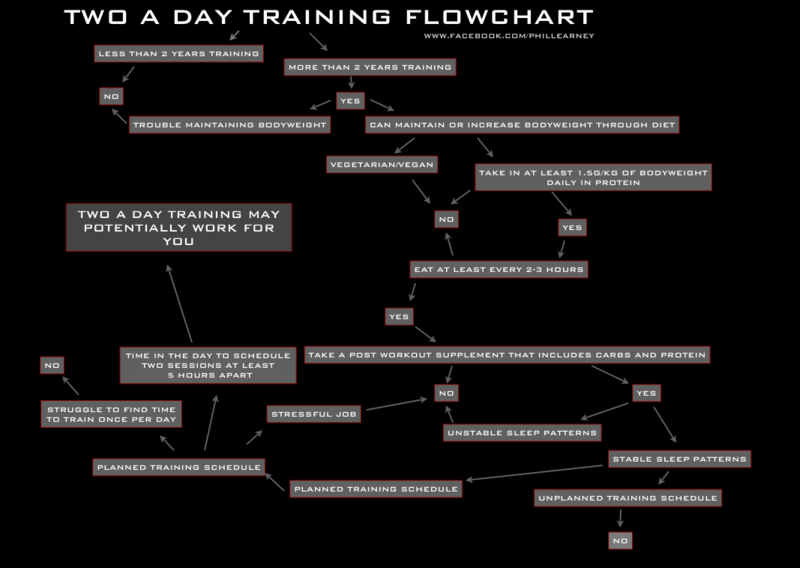 Assuming you’ve passed the flowchart and everythings looking good I’ll explain shortly how to structure a program. A few things to understand first. First thing to understand. JUST because you have time to train twice a day does not mean you have changed your heritage to krypton and developed some mutated superpower. Multiple sessions are basically ONE session divided up so you can take advantage of several factors. The peaking and accompanied decline of testosterone after heavy training is capitalised on. Total session time is shortened. Increase neural (skill) acquisition, also known as the neuromuscular groove. Going back on the ‘more is not always better’ would be followed by ‘depends’ in almost all cases. This is part of the reason I have put together the flow chart so you can make a pretty informed choice before you even attempt this. I don’t want to overly complicate this as am sure most of you reading this will appreciate. Muscle fibre makeup has a lot to do with what we where born with, what we chose to utilise in our formative years and what we choose to utilise in our latter years. In a nutshell we have fast and slow fibre types, fast is what strength and power athletes need to stimulate as is the case with anyone who wishes for muscle tone with no accompanying size increase (LADIES, listen up!) . Slow twitch is more appropriate to bodybuilding or those looking purely at aesthetic improvements that involve size increase. Fast fibres, sprinters, slow fibres, endurance runners if we look generally at athletic performance. The size increase is depending upon the type of training and dietary input obviously. If someone was to perform let’s say 3-5 explosive reps followed by 8-12 slow controlled ‘squeezed’ reps they are training strength and size in the same rep/set parameter. The trade off being improvements in both will only be 50% each as you can only recover from training stimulus 100% right (just an easier way to think about it). What if we utilised 2 windows training different parameters at different times? Train, eat and sleep twice a day is a great concept and one if utilised correctly works incredibly. Your lifestyle MAY not allow this to happen. For arguments sake I am going to discuss strength and size and what we’re trying to do in order to illicit improvements in both. Strength training is about coaching the body to use or utilise what is already available to it. Have said this before but we only have an inkling as to the true strength potential of the human being. If you think that we have a switchboard (neural switches/nerves) that control billions of small light bulbs (motor units) that allow more light to be produced dependant upon the requirements. Lifting 10kg slowly needs perhaps 10 bulbs to do it so will ‘LIGHT UP’ the muscle very minimally. Lifting 10kg fast means we need maybe 100 bulbs so creating a HUGE ‘light up’ of the muscle. Make sense? The more weight or speed we use the more over time we turn on more bulbs (motor units). Someone with a genetic ability to do this is at a huge advantage and anyone who has utilised a sport that requires this at an early age will always be able to do this better. I use speed training a LOT in my own training for this reason. Sarcoplasmic Hypertrophy is size and Myofibriliar Hypertrophy is referring to strength training. Nb. This ‘lighting up’ of muscle fibres is what is seen when adrenaline causes a sudden and rapid increase in strength. The thing seen as responsible for the anecdotal tales of people moving immense objects when under large amounts of stress. RATE CODING WAS A LITTLE SLOW THAT DAY. To truly train multiple systems the intent must be there to DO different things to stimulate different end results. Too many people just lift with no real intent except moving a weight from A to B. One of the easiest corrections to make to someones program when it’s lacking results in my view is to change this trend. Change the speed or intent at which you lift. When utilising multiple training sessions daily this is a huge factor. If you take the earlier point that if you can increase the cross sectional are of a muscle you can therefore increase its strength potential. If you can increase motor unit recruitment you can increase the cross sectional area. Pre Workout Strategy: Neutropics and possibly stimulants. Tyrosine and Phosphotidylcholine of note. Post Workout Strategy: Liquid form of Carbs and Protein in minimal a 2:1 Ratio moving potentially up to 4:1. Between sessions: 5-8hrs. Ideally soft tissue/regenerative work with a sleep if possible. Pre Workout Strategy: Vasodilators and possibly stimulants. Controlled lifting, Stretch and Squeeze. 3-6 Exercises per muscle group. These can all be adapted to other mixed goals, pretty simple to do so but the volume shouldn’t exceed much more than would be planned for a single session.